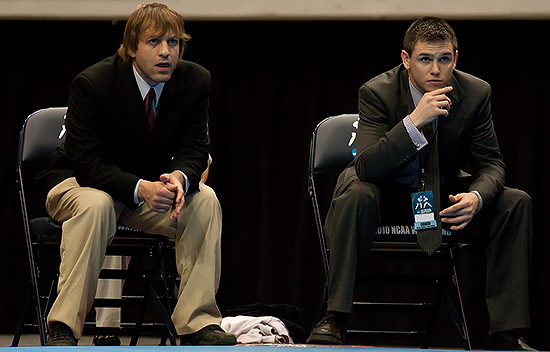 Augs­burg as­sis­tant coach Brad Fish­er (left) and head coach Mark Matzek watch the ac­tion be­tween Paul Bjork­strand (Augs­burg) and Be­be­to Yewah (Wis­con­sin-La Crosse), not pic­tured, in the 133 pound fi­nal of the 2010 NCAA Di­vi­sion III Wrestling Na­tion­al Cham­pi­onships in Cedar Rapids, Iowa on March 6. Yewah won the match 14–9. Augs­burg won the team ti­tle for the 11th time in 20 years.